Sort out your Sofia to Sunny Beach transfer quickly, cleanly and with no hassle involved. With Around Bulgaria’s fully insured personal taxi service, you’ll be chauffeured by a friendly, English-speaking driver. 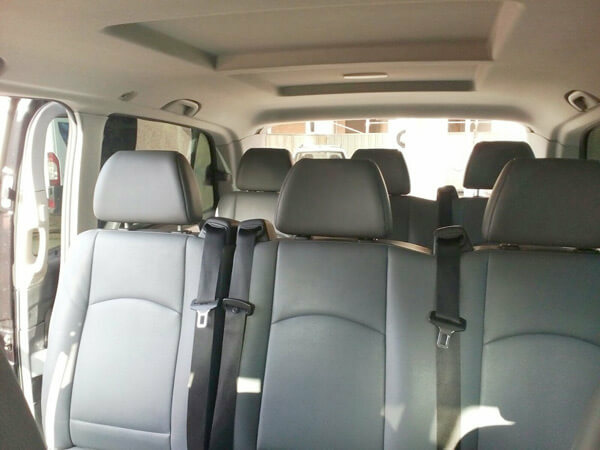 They’ll give you immediate control of the sound system and air conditioning, so you can journey in comfort. If you want some advice to make your stay even better, all you need to do is ask. If you’re worried about what happens if your flight is delayed, don’t be – we’ll wait for you for free if this happens. And, of course, we won’t charge you a thing until your journey is complete. Why choose our Sofia to Sunny Beach taxi service? No upfront payment required: you don’t need to pay any kind of deposit before your journey. Payment: pay by cash in euros, Bulgarian Leva or US dollars at the end of the transfer. Or you can opt for online payment by Visa, MasterCard, bank transfer or PayPal. Fixed rates: all of our quoted rates for your Sofia to Sunny Beach taxi service are fixed and final. We used Around Bulgaria for airport transfers from Sofia to Sunny Beach and back again, the whole experience was great from the start. We were given the option to pay either online or in different currencies upon arrival which made it easier to organise our money, we were greeted on time by our driver Angell, who spoke better English than most English people and had a very well maintained and comfortable Kia Ceed estate car. We were given free bottled water during the journey and our driver was happy to recommend places to visit and places to eat during our stay which were all fantastic. Yuri responded to my initial enquiries quickly and it was very easy to arrange the whole service. Having these guys drive us around took a whole heap of stress out of the weekend and gave us less to worry about during this hectic trip! I would happily recommend this company to any of my friends who are thinking of travelling to Bulgaria and we will definitely be using them again when we return next year. Sunny Beach, famed as the largest seaside resort on the Bulgarian Black Sea coast, abounds in opportunities if you’ve chosen it as the spot for your vacation. Excursions, sports facilities, an inviting aqua-park – all of this and more awaits you by day, with bars, discos and clubs welcoming you for unforgettable evenings (unforgettable depending on how much you imbibe, that is!). The casino and the variety bar, the open air theatre and numerous entertaining restaurants will also be at your disposal. Whatever your taste, you’ll find somewhere to eat and something to do at Sunny Beach. Whether that’s visiting the horse riding school, where experienced instructors will help you mount for the first time. Or, for sports aficionados, the bowling, volleyball, golf and cycling facilities – all of which are available at the resort.